Super Bowl? ANY Bowl????? Being on a diet or eating healthy in general does not have to mean that you have to sacrifice fun-food and flavor!! 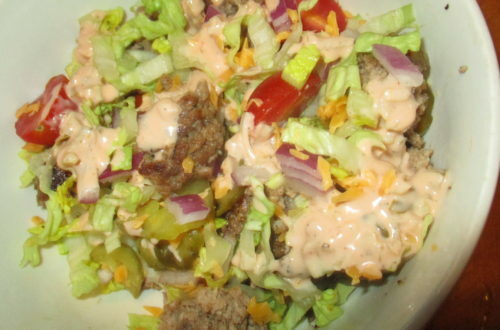 I have lost 55lbs by eating things like tacos, burgers, chili, spaghetti …….. real food, just “fixed”! Hubby, Jeff and I don’t go anywhere for the “big” game. We just sit home and eat and drink watch commercial and the 1/2 time show. Then eat and drink some more! The best part? We do NOT have to drive home when its over!!! But that is an OLD recipe! Let’s move on to a NEW set of party recipes! Let’s start with a favorite of mine. 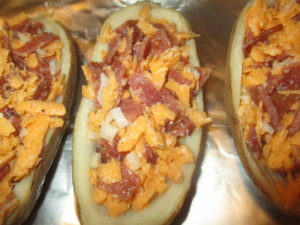 Simple enough ingredients baked potatoes, bacon, cheese, onions for 1 version. 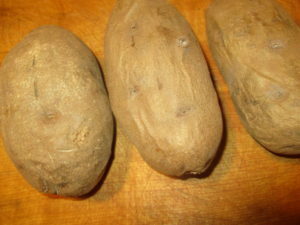 I made basic baked potatoes. 1 hour in a 350o oven will do a medium sized potato. I really like to bake mine the day before and let them cool off and put them in the fridge overnight. This makes them easier to handle, but it “toughens” the skin so that scooping out the inside of the potato has less of a chance breaking thru the skin. I cut a couple of the scooped out halves in half and managed to get 3 halves in 1Y. Cool! I made a mixture of 2/3 cups of shredded cheddar cheese, and 6 large (or 12 small), partially cooked turkey bacon slices, chopped up and a few tablespoons of onion, salt, and pepper mixed in. 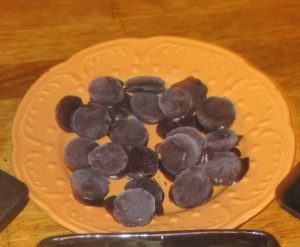 I just divided the mixture between the 3 potato halves I was making of this flavor. Because I had another flavor in my mind too……..mushroom and swiss!! 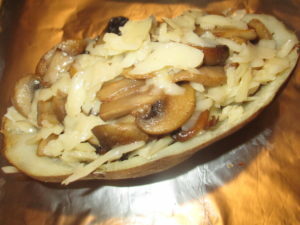 I sautéed 1 cup of mushrooms with a bit of olive oil until they shrunk by about 1/2 and to that, I added 3 tablespoons of shredded swiss cheese with it and stuffed it into my last potato half. Baked all of them in a 350o oven for about 15 min. or until all melty looking. 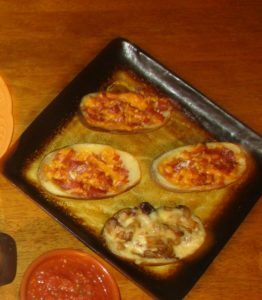 I wanted the ability to only eat a 1/2 at a time so that is what I counted as a serving size…..my container counts are 1/2 potato as 1/3Y 1/3B 1/3R for the cheese and bacon one. Counts are 1/2 potato as 1/3Y 1/3B 1/2G for the mushroom swiss version. 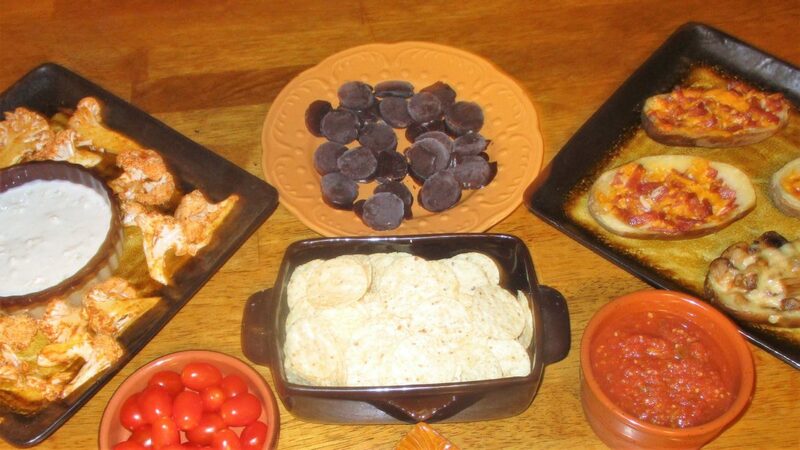 Speaking of DIPS?!? They are perfect for any game day! Any of those would make a fantastic addition to your table! I love me some Buffalo Chicken Wings….. and the healthy Buffalo Dip above can go a long way toward that craving. But I have fallen in love with some simple Buffalo Cauliflower Bites. 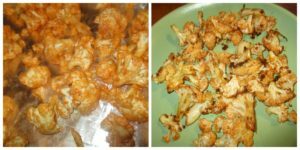 I recently found cauliflower for 98 cents a head and wanted to try as many new recipes as I could in a 72 hour period LOL! 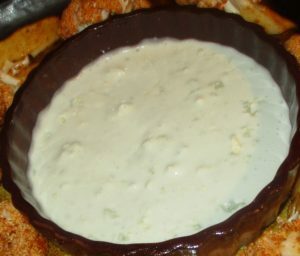 So I created a basic recipe with some blue cheese dip to go with them! 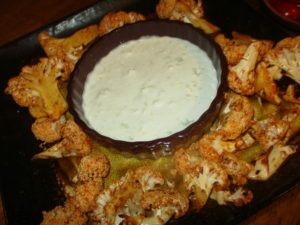 For the Cauliflower Bites, you only need 4 simple ingredients. 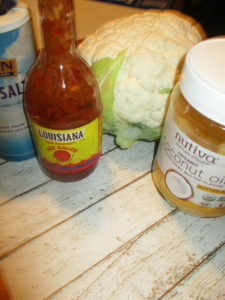 Cauliflower, butter (I use butter flavor coconut oil), hot sauce, and sea salt. 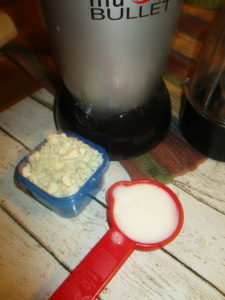 I measured 4 cups of cauliflower florets, 4 teaspoons of melted butter, 4 tablespoons of hot sauce and a sprinkle of sea salt into a large bowl and kept stirring it around and around with a rubber spatula until all of the liquid stuck to the flowers. I turned it all out on a cookie sheet lined with parchment paper sprayed with olive oil spray. 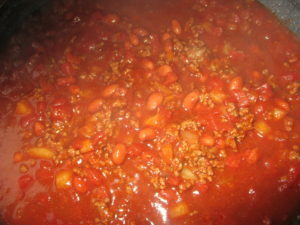 Cook them for 10 minutes at 400 degrees then turn over and cook for another 10 minutes or till starting to brown. 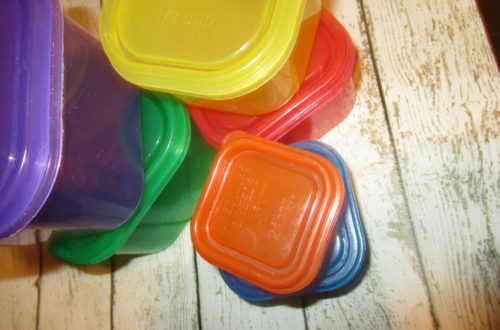 I measure my Green container and count it as 1G and 1teaspoon. On to a blue cheese dip and again I wanted something simple. I used 1 blue container/ 1/3 cup of blue cheese and 1/4 cup almond milk and just mixed them in my Nutri Bullet till they were creamy, then I poured 1 more Blue/ 1/3cup of blue cheese into it so it would be “chunky”. 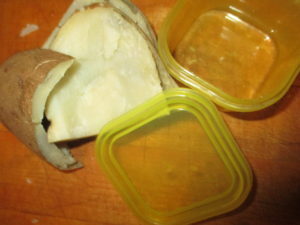 I measure it in my orange container like I would a salad dressing so I had plenty to dip my HOT cauliflower in. I hope your team does whatever it needs to do!! I am OFF to plan a winter trip to our wine country for an event one of the wineries does, called Gumbo Sunday! I am itching to make a 21 Day Fix Gumbo soon!